February 4, 2016: The French AMF has issued a warning about unauthorized forex brokers. ICMarkets is on that list. CLICK HERE to verify. Other websites of this company include ICMarkets.com.au. Deposited and traded with ICmarkets for a good 5 months. Lost a few k and decided to transfer more funds 70k in to continue. After transferring the funds successfully and trading for a week, funds were suddenly withheld from me citing reasons like no trading took place. I have all the records and evidence of how scheming and dishonest this ICmarket is. Trade with them at your own risk. I've been working with IC Markets for a couple of months and I like their support, fast communication, their servers and slippage. They answered all my questions in no time. They also helped me with any problems or questions I had, servers work great with all the signals I copy. So for me IC Markets is a top broker. hello, its so sad i withdrew funds from icmarkets since last year i deposited. i withdrew $203 into my debit card between march 12-14th 2019. a week after i withdrew $100 hoping the $203 would come in sooner but i was deceiving myself. i emailed and chatted them they said i wait 10working days. its over 15working days and i havent been paid. i contacted icmarkets before 10working days but all they could send me was a proof of transaction receipt that they approved the funds and its been sent so i shld contact my bank with the receipt to trace funds. afterwards when it was over 10working days i chatted them and they said i need to ask of the arn code to trace funds. y didnt they give me arn code before now, y give me the transaction receipt. i emailed them for arn code and they said they would contact their bank but its over 3business days now and i havent been given the arn code which i suspect their bank hasnt processed the funds. i finally got an email from my bank after i emailed them to trace funds with the so called transaction receipt and they said i shouldnt contact the sender of the funds which is icmarkets if they actually sent funds cos there is no such funds in their account. so please icmarkets kindly tell your bank to process my funds as i need my money asap cos i know they didnt if not why does it take so long to get the arn code. pls necessary authorities should intervene. I have been using Icmarkets for about 8 months and their service has been very good so far. Support staff is excellent and quickly provide necessary help. Market executions of the trading platform also very good. Highly recommend. All my dealings with IC Markets have been great, and all the staff are helpful and knowledgeable. The live chat system works well and I'm always connected to someone within 2 minutes. Transferring money between accounts is easy and so is withdrawing funds which only takes a day or two depending on the payment type (PayPal or Bank etc.). Overall, very happy with IC Markets and will continue to use them as my broker for the foreseeable future. IC Markets, I find are a good broker. They have reasonable spreads, the deposit and more importantly withdrawal process is quick. Also, the customer support is excellent. My experience of the live chat is second to none, knowledgeable and very helpful. This is pretty much the reason I will stay with IC Markets. 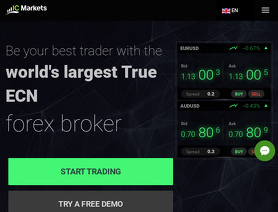 ICMarkets is a reliable and professional ECN broker, their support is always available and kind. Since 6 months of trading i got no problem with them! They have a great offer of instruments you can trade and good spreads to deal with. One of the few brokers that have a good customer support. One of the few good brokers out there who's team is responsive and helpful and actually provides solutions. I'm giving it 4stars only because I want to see how it holds upto it in the future. If everything stays as hassle free as it is I'll definitely update it to 5stars. Quick responses, and the mt4 account doesn't freeze up like some other brokers. I joined ICMarket a few months ago and deposited money using Skrill App. For personal reasons, I needed to change my deposit and withdrawal method. Well, according to ICMarket Strict Money Laundering Policy I wasn't able to change the method so mailed the Accounts department and did all the formalities for the process to finish. But the next time I withdrawal the amount, the same issue occurred. I would be really thankful to so cooperative Staff, one guy was dedicated to my case only and a long communication started. He was very polite and helpful. This is not the first time when ICMarket helped me to do so. Every time I face issues they are very helpful and Quickly responsive. ICMarkets is very good. Quick deposit and withdrawal. Vietnamese support staff are friendly and enthusiastic. I'm very satisfied.